We had booked this flight departing from JFK Airport to Cancun on Christmas Day because every post offering travel advice on the web, even one of my own, suggests there are fewer crowds and holiday fare spikes are less ominous when you fly on Christmas Day. Still, we paid twice as much for our ticket than we had paid for the same route less than a month before. If anyone was grumpy about having to work, they didn’t let on (except for one outlier at check-in). Everyone seemed to be in the spirit and some even dressed for the occasion. 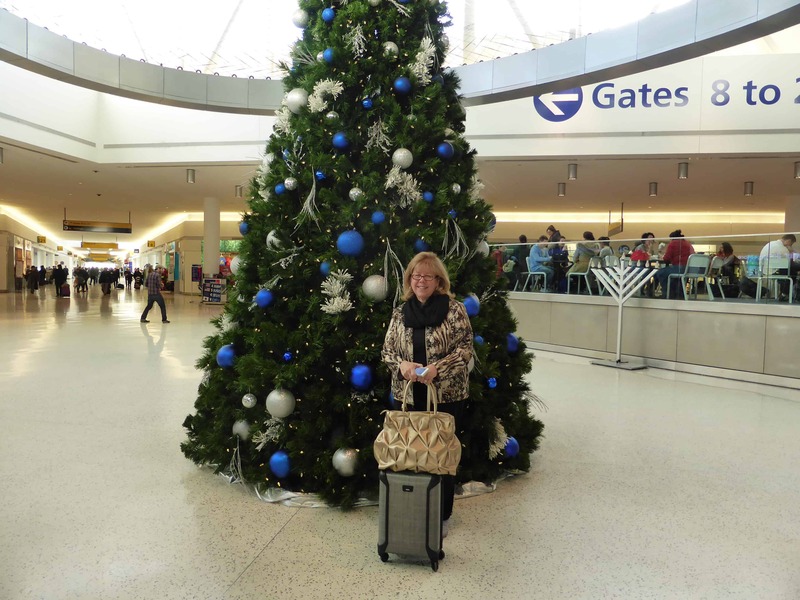 The terminal was also “dressed up:” Wreathes above the gates, a Christmas tree in the lobby and a politically correct menorah as well. My husband and I had booked window and aisle seats on our Jet Blue flight (Row 5, seats A & C) hoping that the middle seat would remain vacant. No such luck when you fly on Christmas Day. To our dismay, a visitor from Stockholm sat down in the seat between us, also on his way to Mexico on vacation. When he extended his arm forward through to Row 4 to caress his girlfriend, I decided to pay it forward. Jerry and I have been married 32 years and we’re still so in love but I decided, since it was Christmas and we have more time to travel, to exchange my seat with hers so they could sit together. If I were her age, I would have appreciated the Christmas gift. Beautiful story, Irene! You have such a big heart. I love the PC menorah. My office complex is not so PC. It’s all Christmas and lots of it. You look so nice when you travel! I’m of the yoga pants, hoodie, ponytail contingent.